This was a small, unmarked, undated snapshot from one of the Hogan photo albums. I've dated it to roughly 1912-13, based on the apparent ages of the children: Thomas J. Hogan, born December 1907 and Edmund A. Hogan born March 1910. I believe it was taken in the Brooklyn back yard of Thomas Hogan, or possibly his son Joe (father of the two boys). 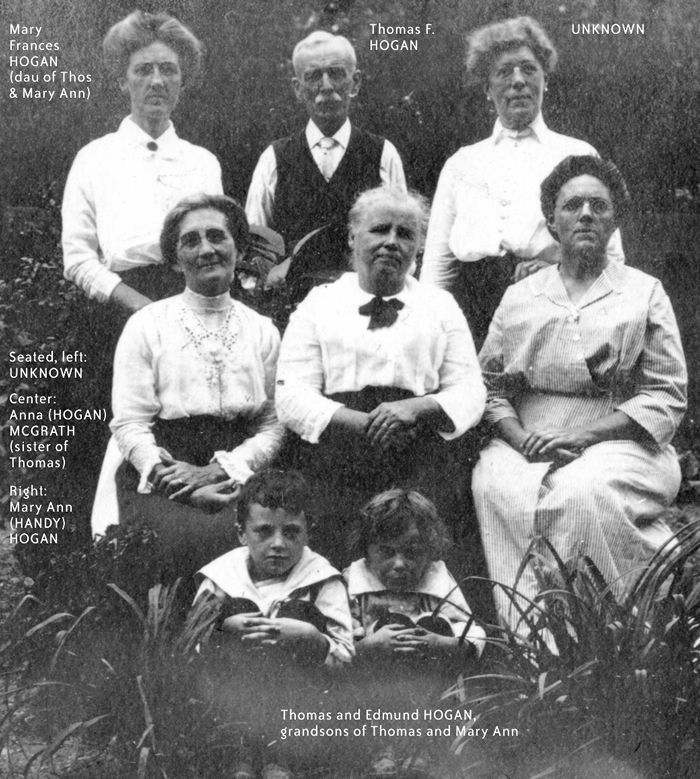 My mother has identified Thomas F. Hogan (roughly age 63), his daughter Mary F. (38), his wife Mary Ann (Handy) Hogan (55), and the two children. Thomas's sister Anna (Hogan) McGrath of Hackensack was identified by her grandson Henry Nicolaus. She would have been in her late 50s. We don't recognize the women seated on the left or standing on the right. They could be Hogans, Morgans, Handys, Donohues, or even unrelated. Based on the appearance of the adults alone, I would have dated this much later, but the children's ages make are unmistakable.